In the United States, 4.2 million youth experience homelessness each year. Together, we can change that. LGBTQ Youth are 120% More Likely to Experience Homelessness. According to a recent study from Chapin Hall at the University of Chicago, LGBTQ young people are 120% more likely to experience homelessness than non-LGBTQ youth. Right off the bat, these young people are presented with an uneven playing field. True Colors United is working to level that field so that LGBTQ youth are no more likely to experience homelessness than anyone else. We’ve seen this higher risk reflected in our own research. It’s estimated that about 7% of youth in the United States are LGBTQ, while 40% of youth experiencing homelessness are LGBTQ. "It is important to create a setting where young people feel like everyone is working collectively." Why Do LGBTQ Youth Experience Homelessness? 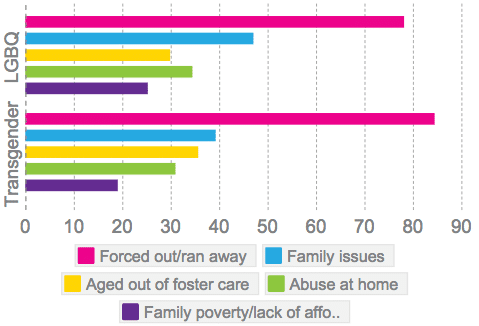 Family conflict is the most common cause of all youth homelessness. For LGBTQ youth in particular, the conflict tends to be over their sexual orientation or gender identity. While rejection is the most frequently cited reason LGBTQ youth experience homelessness, it’s not the only one. According to service providers, additional reasons include aging out of the foster care system, poverty, and conflict in the home. Often, it’s not one thing that causes homelessness, but a combination of many. "I feel that I was placed here on this earth to advocate the best way I can." Nearly all homelessness service providers report working with LGBTQ youth. That means we need to make sure all service providers know how to provide safe, inclusive, and affirming care for ALL youth! It's also crucial that all levels of government are doing what they can to help fund these vital services and ensure that LGBTQ youth are protected when seeking support. Our Inclusion Directory is a national database of organizations that provide services to LGBTQ youth experiencing homelessness. LGBTQ Youth Experiencing Homelessness Have Unique Needs. While LGBTQ youth experiencing homelessness have similar needs to their non-LGBTQ peers, they also have needs specific to their identities. “LGBTQ” is an umbrella acronym intended to represent sexual orientation and gender identity, but that doesn’t necessarily mean that the needs of each specific identity under this umbrella are the same. What do lesbian gay bisexual and questioning youth experiencing homelessness need? The service providers we surveyed identified housing and identity-related supports as the two greatest needs for lesbian, gay, bisexual, and questioning youth experiencing homelessness. For transgender youth, housing was the most frequently cited need, followed by access to transition-related supports. Transition-related supports include access to legal support, name/gender marker change, access to healthcare specific to transgender youth, access to hormones, and emotional support. "I made my future my own. I face whatever comes at me with no fear." In terms of health care, LGBTQ youth tend to be underserved due to a shortage of clinics and facilities that cater to their unique health needs – and because some healthcare providers refuse to treat minors without parental consent. We asked homeless youth service providers what they thought about the physical and mental health of the LGBTQ youth they serve. Overall, they reported the physical and mental health of LGBTQ youth experiencing homelessness are worse than that of non-LGBTQ youth. Notably, providers were more likely to report that transgender youth experienced these disparities. "It's crucial that we create safe and affirming spaces for all young people." People often think that, because they don’t work at a shelter or service provider, they don’t have a role to play in the effort to end LGBTQ youth homelessness. The reality is: Everyone can make a difference! LGBTQ youth experiencing homelessness interact with more than just the folks working at shelters. They also go to coffee shops and libraries, ride public transportation, go to school, use social media… To put it simply: They live life! We all share the same world – and we all could do a better job at making that world a better place for young people. Interested in learning more? Check out our Learning Community, where you'll find our suite of online courses and toolkits.